Our brains can be primed to lean toward a thought or word or number. Today’s behavioral economics podcast is another foundations episode, and it is all about priming. I share examples of how easy it is to trick the brain into thinking and answering something wrong with just a little priming. When primed, your subconscious remembers it recently heard a number, or a statistic or something and that influences the next assumptions it makes – even if they are not even remotely related. 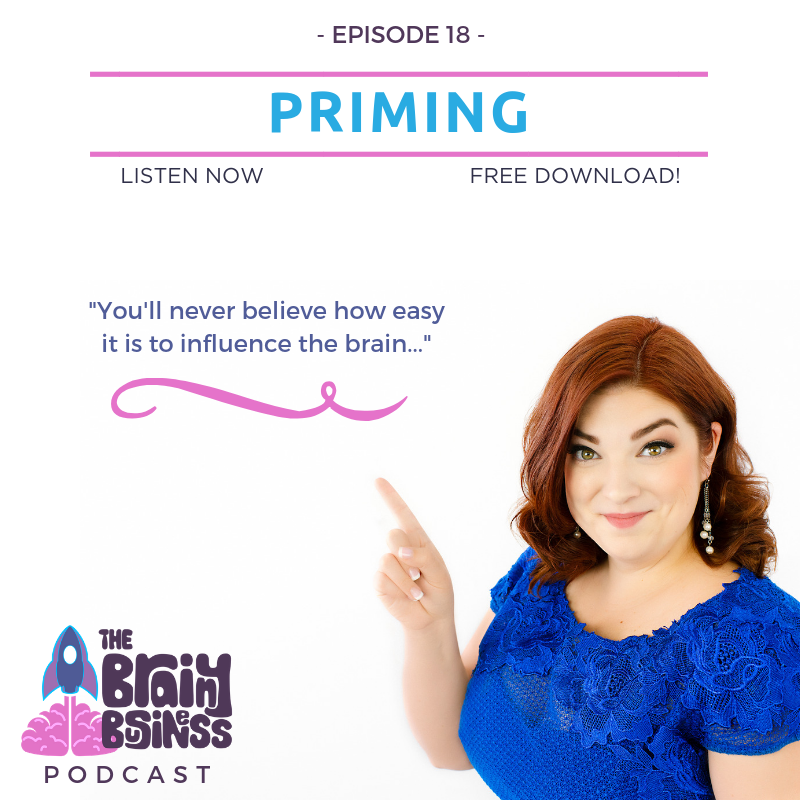 I share examples of priming, research and studies related to priming, and examples of how you can use this concept to grow your business and profits. [09:28] I share a rhyme and a question that shows an example of priming. Rhyming can be one way to prime the brain. [11:11] Our brains will hear a number and then adjust up or down from there. This is another example of priming. Especially, when done intentionally like the examples I gave in Episode 11. [11:34] Our brains are lazy and incredibly busy, so they take shortcuts all the time. [11:48] Our subconscious brains need to make snap decisions. When primed, our brain will make assumptions based on the previous word or number that it has heard. [12:18] I was giving a presentation to a group of female entrepreneurs (something I do a lot!). I asked everyone to think of the last 2 digits of their social security number. Then assign a value to the necklace I was wearing. Those with lower number socials assigned lower values, and higher numbers assigned higher values. This is the power of priming, the root of anchoring and adjustment. [14:10] A priming example, where sales of Snicker bars were increased just by using the number 18. [14:39] Limiting the number of cans of soup that someone can buy actually primes them to buy more. [14:57] Priming can also be done with words. A priming example where students primed with words about elderly people actually took longer to walk to the elevator. [17:30] They also did a study with rude and polite words. People primed with the rude words were much more impatient and likely to interrupt. [19:17] A stereotyping example of priming. Priming people with words from a certain stereotype can actually affect the results on a math test. [21:19] Prime yourself for success. If you doubt visualization, think how easily the brain can be primed. [21:55] The power of visualization. There is a reason why Olympians train their brains as well as their bodies. [22:48] Mental training may be even more important than physical training. [22:59] The steps the visualization. [23:01] 1. Know what you want. Ask yourself what you would like to see if nothing was holding you back? [23:15] 2. Describe your vision in detail. [23:28] 3. Start visualizing and create the emotions. [23:41] 4. Take daily actions. [23:58] 5. Have grit and persevere. [24:27] Priming with physical objects. Participants in a study were asked to hold a cup of either hot or cold coffee. People who held the iced coffee actually rated the person in the story as being much “colder” than the hot coffee participants rated them. [26:03] Participants in another study were more likely to clean up crumbs after a snack when there is a faint hint of cleaning products in the air. [27:09] Several studies have been done where certain objects or smells will affect people’s behavior. [27:48] The takeaway from all of these studies is that everything we do and say matters. Whatever was said or done right before we do or say something also matters. [28:34] You can’t control everything, but it is worth looking into the things that you can control. [29:25] Remember, what comes first matters much more than the price itself. [30:25] With these priming examples, small things and a few simple words can make a huge difference. [30:54] If you find people are always rude when they talk with you. Or treat you like you are cold and distant. It could be a bad prime. [31:25] A study where participants were shown a flash of a logo for an imperceptible 30 milliseconds. Participants shown the Apple logo were more creative than participants shown the IBM logo. [32:15] Participants shown a Disney logo were much more honest than participants who saw the logo for E! [32:23] Have you ever heard people say you become like the people you spend the most time with? Or that you should dress for the job you want? Or that you should “fake it till you make it”? [32:36] It seems there really is some truth to that. You are priming your brain to take on the traits of those outside influences. [32:55] Prime your brain in a way that you want to be approaching your day in your life and business. [33:14] Notice how quickly a brand is noticed. Ask what the traits of your brand are? [34:21] These things may not register on a conscious level, but they have an impact, even if people don’t realize it. [35:03] Marketing and advertising takes dedication and focus; consistent presence and messaging to break through the clutter. [36:51] Book your strategy session for a free consultation call now. [37:52] On episode 19, I am going to dig into the foundations of herding – so get ready for some more amazing studies.